WILL CHRYSLER & THE AUTOS LEAD THE “L-O-N-G AD” BRIGADE, AGAIN? SB ads were transformed by the Chrysler’s 2011 “Imported from Detroit” ad. Eminem’s 2 min ad signaled the return the L-O-N-G ad (at least 1 min) to TV. Though SB I (1967) featured the genre of the day (60 sec ads) we could not find a 2 min ad. In 2011 there were 9 long ads (4 from AUTOS). In 2012 with Clint Eastwood’s 2 min “1/2 time in America” there were 17 L-O-N-G ads (with 9 from AUTOS). In 2013 Chrysler SBed 2-2min ads (Ram truck’s Farmers’ ad & Jeep’s “Family Waiting” ad). 2013’s SB saw 17 L-O-N-G ads with the AUTOS wheeling 7 of them. Incredibly in 2014 there were 23 1 min or longer SB ads with 12 of the being from the AUTOS, 12! WOW! (In that group was Bob Dillion’s 2 min Chrysler ad called “America’s Import”. What will SB 2015 bring? While we don’t know, we must INCREASINGLY confess that we expect that there will be MORE OF THE SAME. Past Eminem, past Eastwood, past Oprah (Jeep’s “Family Waiting” narrator), past Dillion and 10 other L-O-N-G AUTO ads in SB 48, here comes SB 49’s L-O-N-G AUTO ads. WANNABET on the #? 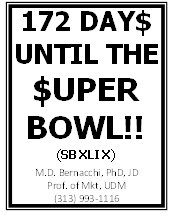 With the NFL’s pre-season at hand we count ONLY 172 days till SB 49. (SB XLIX will kick-off at 6:30pm Feb 1st, 2015 in Glendale, Arizona at the U of Phoenix’s Stadium.) Unlike last year’s SB 48 being the 1st outdoor cold weather venue, this SB is in AZ not NY/NJ. (Last yr all turned to the Farmer’s Almanac’s predicted Big Apple winter storm on SB wknd. Well, it didn’t happen. For SB 2015 the Farmer’s Almanac predicts that, Glendale will be warm & wet) As America’s #1 sports entertainment event, the SB is surrounded by BIG $$$. SB 48 had an estimated econ impact of $600 M & Fox charged $4 M per 30 sec TV comm’l. 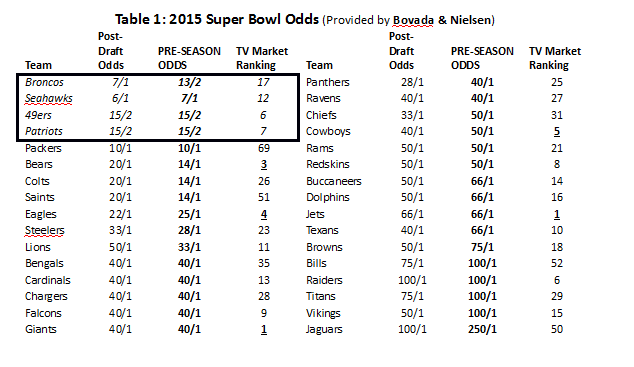 The earlyline on SB 49 is $500M± econ impact and 4½M± for an NBC ad. Advertisers are already battling for the limited available SB spots. (B/C of previous commitments 1/2 to 2/3 of SB ads have already been sold). JUST 4 THE RECORD : The 4 teams with the BEST PRESEASON ODDS to make the NFL’s “Final 4” in 2014 did precisely that. Furthermore, last year’s Final 4 (DNV, SEA, SF, & NE) are PRE-SEASON faves to repeat. Their ODDS can be found in T-1. We shall see sports fans. We shall see! CANADA & THE SUPER BOWL? We all know that the CFL is NOT exactly the NFL. NUF SAID! We also know that while the Grey Cup is N America’s 2nd oldest pro sports team trophy, it’s probably at least 1 shade of grey (of the 50) behind the Lombardi Trophy. With that all said & done, how about this? Etan Vlessing (Hollywood Reporter) gave us some great SB mid-summer “giddyup” regarding CTV & its SB telecast. He told us that CTV with CA rights to air the SB will replace its “high profile Canadian comm’ls from major local businesses such as Ford (CA), Labatt Brewers, McD’s (CA), etc with “must see” TV ads provided by Canadian Ad Agencies. Yes, this is a SB ad playoff among CA’s ad agencies. While there will be NO slap shots the 5 finalists will be “slingshotted” into CTV’s ad slots during the SB pregame show. The victor’s ad will be aired during CTV’s most watched program of the yr, the SB!?!? According to Vlessing the TV audience for SB 48 was 8M (of Canada’s 35.1M pop.) Canadians can also watch the US’ SB ads on line. SB 49 will be AZ’s 3rd SB. The other 2 (in 1996 & 2008) saw NFC teams. (DLS in ’96 & NY in ’08) as winners. AZ was scheduled to host the game in 1993 but the NFL moved it to Pasadena, Cal b/c AZ failed to recognize Martin Luther King Jr Day as a holiday. In 1992 AZ voters finally holidayed MLK Day. The NFL however, had already moved the game, so AZ was given SB 30 as a “make up” SB. It looks like AZ got the message this time. In Feb its Gov, Jan Brewer, vetoed the Religious Freedom Restoration Act (which allowed bizes to REFUSE service to anyone on religious grounds. This veto happened after the NFL issued a reminder to AZ about being tolerant & inclusive or “Don’t forget the 1993 SB”, [Forbes]). 20+ yrs ago AZ ignored the NFL’s threats. This time they heard the discrimination message loudly and clearly. As a result AZ will now unapologetically host SB 49 like any “good” NFL city would. No HALF-TIME PERFORMER has yet been announced for SB 49 Under the leadership of user Ed Ball 121k+ FANS have petitioned the NFL (change.org) to have Weird Al Yankovic be the ½ entertainter(Time). Mr Y’s 14th studio album quickly became #1 in July on the US Billboard charts, making it the 1st comedy act to be #1 in over 50 yrs (The Guardian). Like everyone else the City of Phoenix is excited for the start of the NFL season. The city unveiled on 8/6 a 55-inch monitor at the Phoenix Sky Harbor International Airport counting down until the big game on Feb 1st(AP). TICK-TICK-TICK-TICK-TICK-TICK-TICK-TICK-TICK-TICK-TICK-TICK! This entry was posted in Uncategorized and tagged Chrysler, NFL, SB XLIX, super bowl, Super Bowl Advertising. Bookmark the permalink.